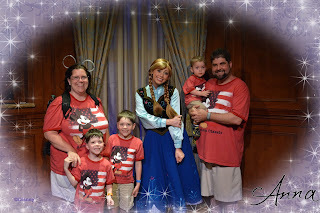 All of a sudden our Epic Disney trip was drawing near an end. I'm not sure how it happened. One minute we were halfway through, then all of a sudden I was waking up one morning and taking last requests. We were supposed to be up bright and early, theoretically the park was to open at 9, and we were to have 9:15 reservations at Crystal Palace, for breakfast with Pooh. I booked it because I wanted to get in early, so that we could take pics with the castle, with No People Around. And early reservations was the only way, so I'd heard. Only the bumped the park opening, after we got there, allowing the park to open an hour and some change to the public before our reservation time. Forget that noise. So we cancelled, and slept in a bit. We must have been getting slower, and tired, because we didn't get into the park until nearly 10! Our official missions of the morning were to ask the boys what they wanted to do for their last hurrahs. My Request was for Dumbo. 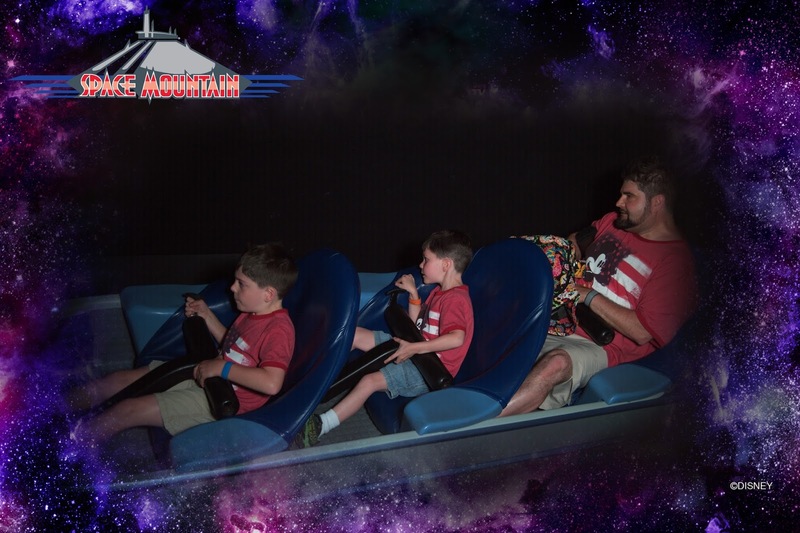 Eric's last request was Space Mountain, which the boys decided they really wanted to do too. Initially, we didn't think anyone would be interested in that. But Chris has decided he likes Roller Coasters, so we did a few. 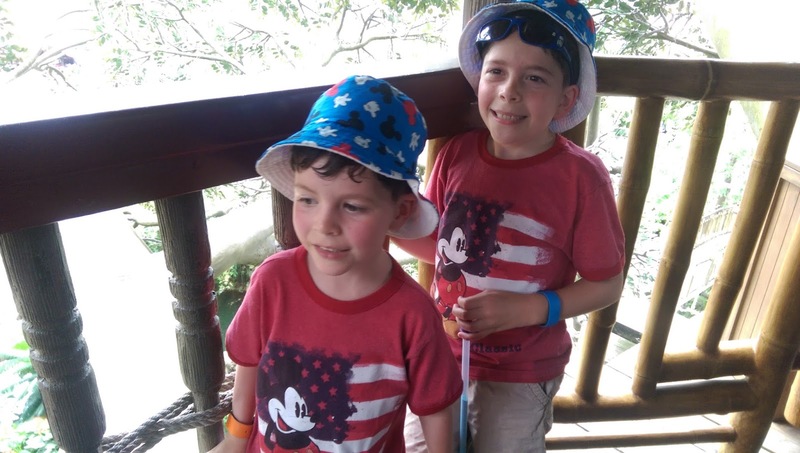 Sam wanted to do Haunted Mansion, and Chris wanted Swiss Family Robinson Treehouse. These kids have no fear. On Jacob's behalf, we figured he would have wanted It's a Small World. It's a Must Do! And even though Jacob didn't know what he was missing yet, we figured he'd love it. 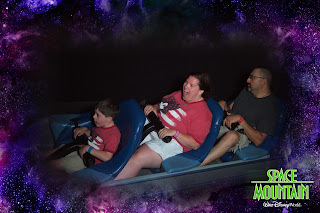 So as soon as we got to the park, we checked in at Space Mountain, and we figured we go do Dumbo while we waited. We figured we could do the Standby line since it was only a half hour, and they had the new playground section to play on during long waits. Well, that thing rocks... and actually, unfortunately, the boys felt like they didn't get enough time in the playground. Before we knew it, it was time to Ride. We separated our group, Chris and I took one elephant, and Sam, Jake and Daddy took another. Though I think Sam and Jake would have been perfectly content by themselves. Jacob started thinking he was big stuff in the playground, doing rides and such by himself. Selfie with my baby as we get started on Dumbo. 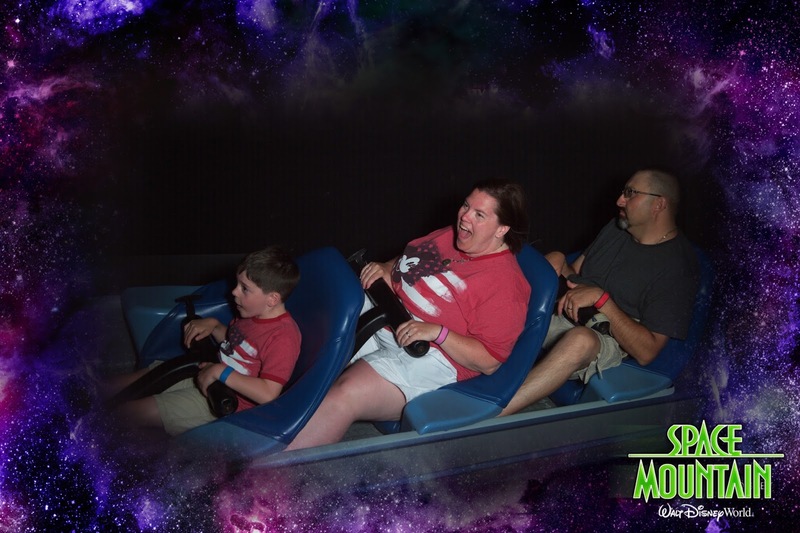 After Dumbo, we headed back to Space Mountain. 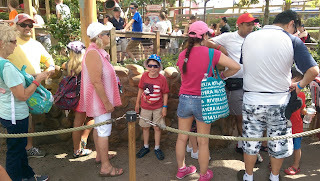 I decided to take the first parent shift, after we got the rider swap pass, so Jake and I went to the bathroom, and commenced waiting in line to order lunch at Cosmic Ray's. I didn't take into consideration having to grab a tray and push a stroller, so I was Very Grateful when a CM helped me find a table outside in the shade, carrying our tray, so that I could just deal with Jake. Then we commenced lunch. When the boys came back from Space Mountain, Sam looked a little seasick, and said, "I don't want to do that again." Meanwhile, Chris was yelling, "THAT WAS AWESOME!" Pumped fists and all, he could barely stop moving to eat his lunch, before he and I headed back for our turn. Meanwhile the boys went to the Haunted Mansion. Chris loved the ride, but the 'moving room' freaked him out. As he was telling me, I was like, you mean the elevator? He was like, what?! Apparently, he had not picked up on the fact the room moved like an elevator. His mind was blown. 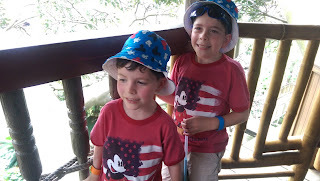 From there, the boys went and checked out the Swiss Family Robinson Treehouse. They thought they could just climb and play and run wild. But really, it's a bit more mild than that. So the boys were a bit disappointed it wasn't a True Treehouse. So after that they rode Aladdin's carpets and all was right with the world. I woke from naps to find a text from Eric saying we had Reservations at Tony's at 5. I didn't have to Wake Jake, but I had to scoop him up to get moving to get there on time. I got there with about 10 minutes to spare, and Eric wrote, he had to wait on Chris. Chris had decided to ride the Barnstormer. By himself! Yeah, he finally fessed up that he actually loved Roller Coasters. But Sam does not. So Chris got to do Barnstormer alone. What am I gonna do with him? Just watch - first it's this, next The Beast in Kings Island! I got a Thrill seeker! Meanwhile, I got to enjoy a little time to photograph Town Square. They are doing construction on Main Street, so the view is a little squirrely. But still, I got a nice shot! Before I knew it, it was time for dinner at Tony's. I'd never eaten here, heck, I'd never even seen it, it was someplace I walked by to get to see Mickey. Suddenly, it was like this little nook I'd never seen. The inside was crowded, but they had a TV showing Lady and the Tramp on loop, I loved it. And playing some Italian. That's Amore actually did play while we were there. Chris got spaghetti and meatballs, but really it was one giant meatball, and he ate that, and bread. I got a nice pasta with mushrooms that was pretty awesome, and pistachio creme brulee for dessert. Though, NOTE, watch all biscotti. They had a hazelnut biscotti with the brulee for decoration. I took one nibble, and had to clear my throat. I think my hazelnut allergy is getting worse. Hope it doesn't get so bad I need to start carrying an epi-pen. Ugh. The high point of Tony's was how much Jacob loved the pasta. He kept stealing noodles off Chris's plate, so finally we just gave him a few of his own, and he was eating like a 1 year old again, we had to mop him down he was so saucy! I wanted to go gently with him, he'd gotten up at 3 am during the night, with a giant burny poo. And had been pooing all day, such that by dinner he was a red rashy mess. Don't think all that tomato sauce awesomeness was helping matters. But I was glad I'd packed lavender baby balm. 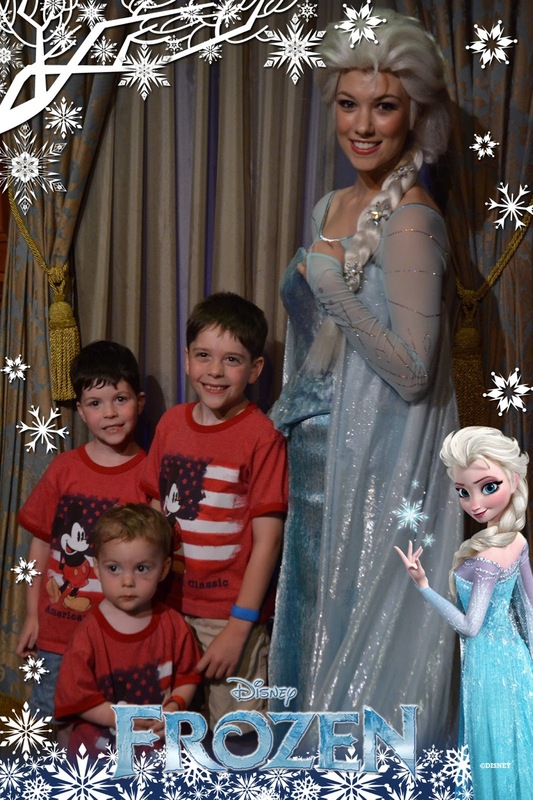 After dinner, we hiked right on up straight through the castle, because we had reservations to meet Anna and Elsa. This was the one and only time on our trip we went through the castle. It's usually more crowded to take this path, but it was more direct to our destination. The boys thought it was pretty awesome. When we got to visit Anna, Jake was initially fine. He went up to her for an autograph just like everyone else. But she was bouncy, and energetic. And he didn't like that. 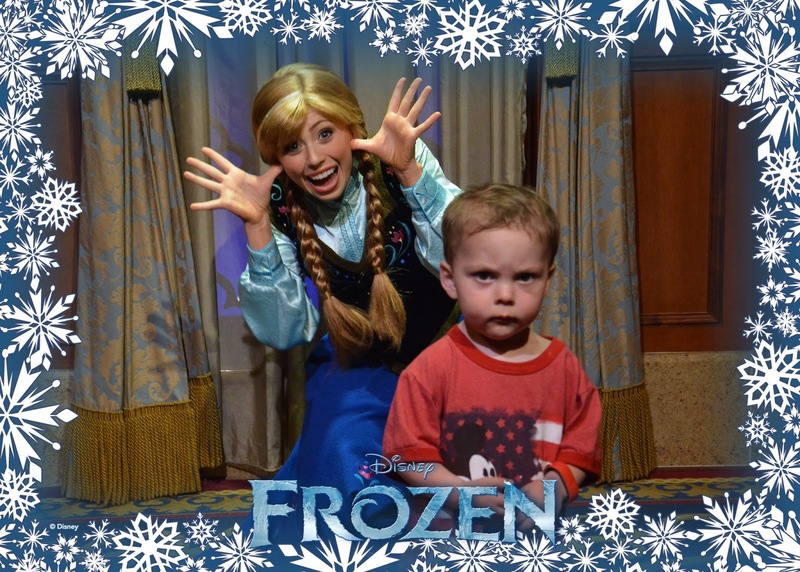 No, he didn't like that at all. He turned away, pouting, and wouldn't line up with her. She tried her darndest to perk him back up, but he would have none of it. 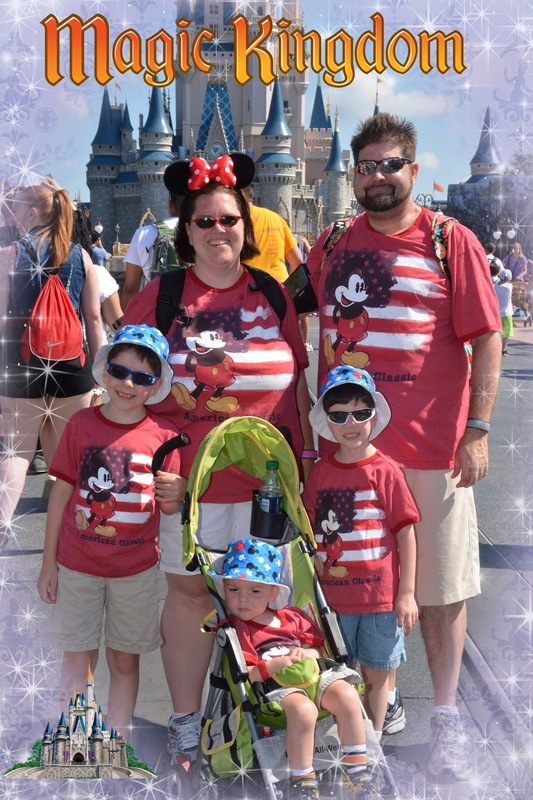 Luckily, the Photopass guys were on top of it, and snagged this shot. I was trying to get him to cheer up. But he wouldn't, not for me. Just for Daddy. He was mildly tolerant for Daddy. 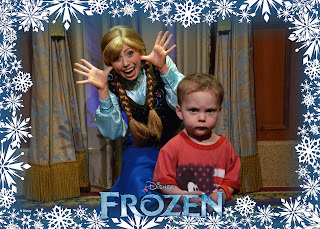 Now see, Elsa isn't bouncy or full of frivolity. Jake was ok with her. 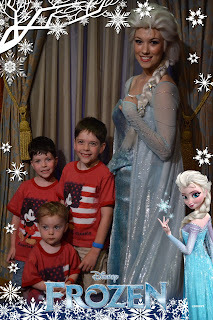 All the boys were thrilled to meet Elsa. I was impressed that she had snuck over, signed the book, while we were messing around with Jacob and Anna. I wish they'd have been together, but it was still neat. My question is though, Where's Olaf?! 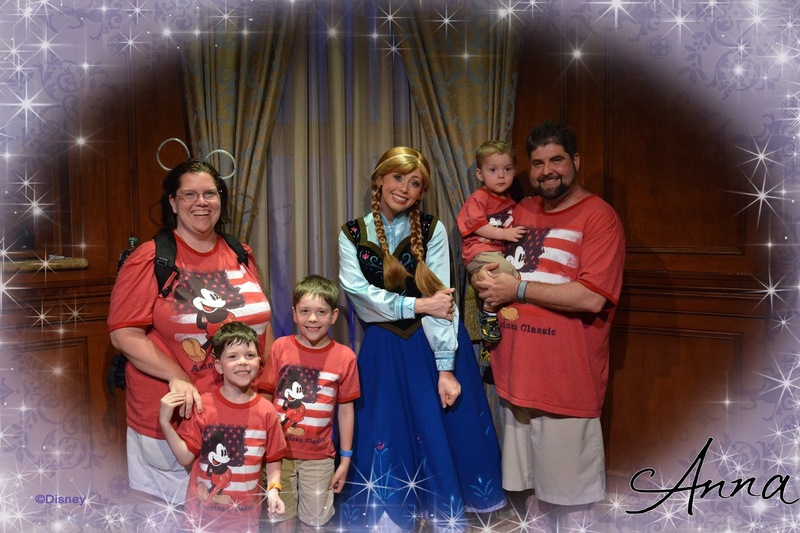 After meeting the Princesses, we headed out and found the Sword in the Stone! All three boys had to give it a try. It wiggled, but didn't come free. It started to get a bit cloudy, looked like we might get a bit of rain, as we headed to It's a Small World. 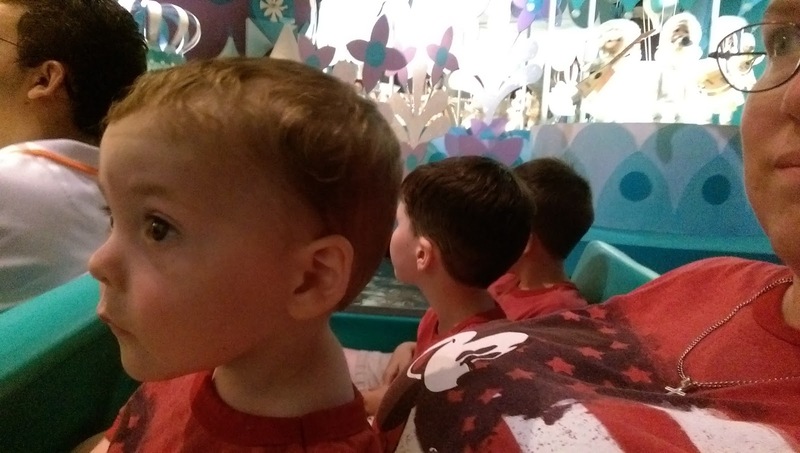 Jacob thought everything about It's a Small World was amazing. I knew he'd like this one. All the boys love this ride. It's funny, none of them say 'I want to ride Small World! ', but they always do, and they always love it. It became a bit more clear as we were leaving Small World that it was going to rain. We had Fastpasses for Pooh and Seven Dwarves Mine Train. But while we were in line for Pooh, actually 3 families from the front, it broke down. Actually, they said Pooh experienced a Honey Spill, and it was going to take them at least a half hour for them to 'clean up', and get folks off the ride. Some were Stuck! Chris would have freaked out to be stuck on there, so I was glad we didn't. But then it started to pour down rain, and they closed Mine Train too, after we'd checked in and gotten rider swap passes for that too. So we lost the last two fastpasses. We just put our ponchos on, and headed back home. I'm so glad we packed ponchos. We didn't get as soaked coming back in the rain as we had at Hollywood Studios. And FINALLY! The gifts that Olaf had sent, that were supposed to be there when we arrived, had gotten lost in their back mailroom, and I'd asked at the front desk once, not in a rush I'd said. But this was our Last Night. Finally, there they were, matching summer Olaf pajamas. The kids reluctantly put them on, but they were more interested in watching some Disney channel trashy tv before going to bed. I think a week is plenty, we were about done.